Emotion is a name of yacht Privilege 465 ,which was produced in 2003. You can charter her from port Marmaris around Marmaris. Emotion is equipped with 11 berths. Berths on the sailing boat are arranged in 11 layout. 5 cabins are located inside the sailboat Emotion. Browse for different yachts by moving to this section: Catamarans Marmaris. Passengers can feel good on this boat , because there are 5 toilettes for their disposal. With 600.00 l l. in diesel tank you can sail really far and still be independent because of 700.00 l liters in water container. Emotion is supplied with motor 2 x 55 HP. 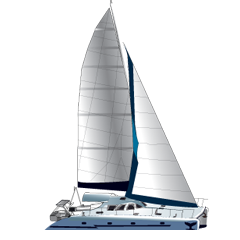 Sailboat's dimensions are: LOA - 14.95 m , width - 7.33 m and 1.35 meters of depth. On the boat you can make use of following equipment: Freezer, Heating, Radio cd mp3, Radar, Autopilot, Gps plotter, Bimini top, Dinghy, Mainsail with lazy jack, Electric hallyard winch, Solar panels, Inverter 12v-220v, generator. . Security caution has value 2500.00 EUR. In our search engine you can effortlessly check avalailability of vessel Emotion from Marmaris clicking here: Catamarans Turkey.